Whatever condition your 4×4, Truck, Ute or SUV is in, we will buy it off you. We will be glad to purchase your automobile no matter what brand it is, or what model it belongs to. And we will come over to remove it from your place regardless of where you live in Perth, Western Australia. 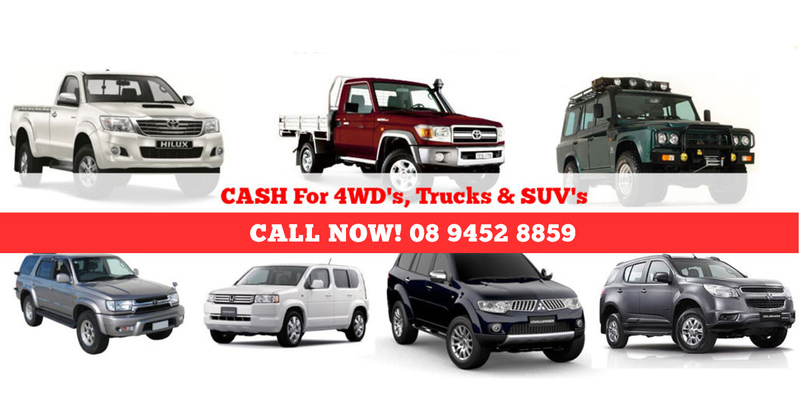 We offer the best prices in Perth for trucks and other commercial vehicles. The minute you say to yourself that there is a need to sell my truck, you will get numerous choices like us and get a confidence because we assure the 100% customer satisfaction. This service is a life saver for any truck owners out there in Perth who have a truck that has entered the junk stage of its life. You can’t just leave that truck just sitting around on your property. It will just further degrade and be worth less and less money as time goes on. Sell that truck today to us here at Perth Auto Wreckers and get good cash for it! You can be sure that the whole process will be as quick and as hassle free as possible. Find out why we are the best option. We are proud of the amount of experience we have gotten from working so many years in this industry. It has allowed us to accumulate all the knowledge, skills and expertise in order to be able to serve our customers to the greatest of our abilities. If you want to know how much your vehicle is worth, you need only call us or fill out the form on our website. We will respond in record time with an offer that will amaze you. When it comes to trucks we will fork out up to $15000. We have many years of experience. As a result our levels of professionalism are next to none. You can be sure that we are both licenced and accredited buyers of vehicles. We recycle the automobiles we buy with great care because we the environment is important to us. We pay more for trucks, 4×4’s and SUV’s than anyone else. And on top of that we also provide a free removal service. If you would like to get a free quote today, call us up at 08 9452 8859 or fill out the form on our website. We want to buy it off you. We don’t charge for the service of having your old truck removed from your property. We want you to get the best dollar amount at the end of the day, and that is why we won’t charge you. So what are you waiting for? Contact us today and book a free truck removal service with us. Most of our vehicle dismantlers & disposal expert’s have more than 20 years of experience in the same wrecking automotive industry. In this case, when it comes to evaluating the price of any vehicle, our combined experience comes into effect and the resultant, we pay the top cash for trucks in the town. Still bothering yourself, how to sell my truck? Hire Perth Autowreckers and enjoy our elite, hassle-free truck removal service. Our staff members can take care of all the legal vehicle licence transfer paperwork on your behalf.